The Montrose Basin LNR is particularly important for birds, especially migrant waders and wildfowl attracted by either abundant food supplies or a safe roost site. 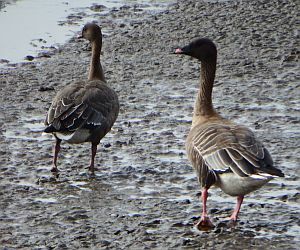 It is internationally important (1) for Pink-footed Goose, Knot and Redshank. 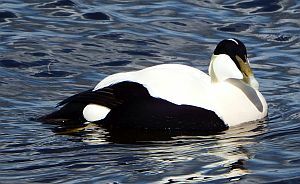 It is nationally important (2) for Shelduck, Wigeon and Eider. There are monthly counts of wildfowl and waders on the Basin and the results give an interesting picture of migration and population dynamics. A total of 213 species has been recorded on the reserve (See list of birds commonly seen on Montrose Basin and their visitor status). The majority of these are winter visitors, passage migrants or both. About 52 different species are thought to breed on the reserve. 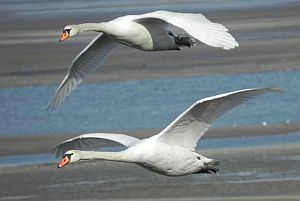 Mute Swan: These birds are present on the Montrose Basin throughout the year. Three or four pairs regularly nest at the western end of the reserve, on the saltmarsh, Lurgies and at Old Montrose. Numbers of have fluctuated during recent winters between 100 and 200 birds. 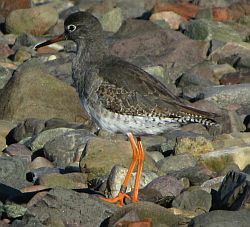 Redshank: This species is not easy to count accurately on Montrose Basin. Winter figures are regularly a little below 2000 but it is likely that present counts are on the conservative side and 2000+ do regularly winter on the reserve. Redshanks, estimated to be in the order of 15-20 pairs, nest in the wettest Mains of Dun fields, the Lurgies and on the saltmarsh itself and wet parts of Gilrivie. 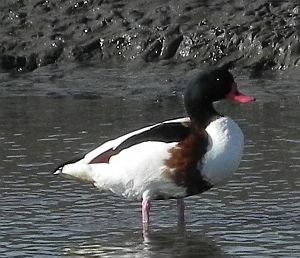 Shelduck: It is thought that over 10 pairs of shelducks nest within the reserve. Nesting areas appear to be near the northern shore of the Basin, the Lurgies 'hanging' woodland, and parts of the sea banks and under the hides. Wintering on the estuary in some numbers shelduck (whose major food is Hydrobia) have reached 900 in recent years. 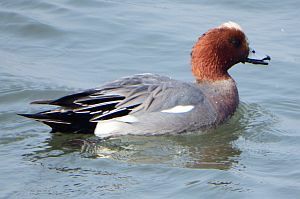 Wigeon: There is some confusion over the changing fortunes of wigeon on the Basin. Local wildfowlers are of the opinion that numbers have declined since the 1970s but National Wildfowl Counts show an increase. Currently about 4000 are to be found here in winter. 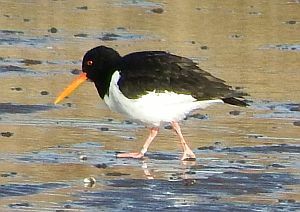 Oystercatcher: Maximum numbers of oystercatchers feed on the Basin's mud and sand flats between October and March when up to 4000 may be present. 10-15 oystercatchers breed over a wide area of land within the reserve. 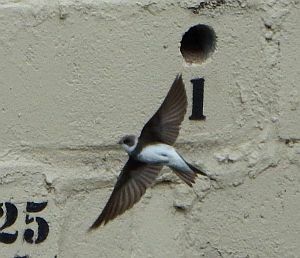 Sand Martin: The artificial nesting wall, constructed in 2002 has been a big hit with the sand martins. Up to 70 pairs are busy through the summer producing one or two broods of chicks. A site is Internationally important if it holds 1% of the world's population of a species. A site is Nationally important if it holds 1% of the UK's population of a species.